Money Education QuickSheetsTM know everything you don’t know faster. The tax and financial planning reference tool that is there when and where you need to know. 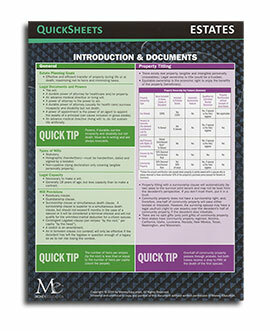 Every QuickSheetsTM title is packed with performance-critical information delivered in a concise full-color format. For working professionals and educators, QuickSheets are a handy and fast professional reference that will save you time and aggravation. For students, if you know what’s on the QuickSheets, you’ve mastered the course. QuickSheets cover all major points (and most minor ones!) in your course and on the CFP® exam. Buy QuickSheets titles individually as you need them for $19.95 each or buy the entire QuickSheets set - all titles over forty-six pages for $99.95 and save $19.70!